Just a quicky to say thanks Vic for meeting my bespoke format requirements and providing a very entertaining evening. Highly recommended to all. Just to say "thank you so much" for making our party go with a swing. We all enjoyed dancing to your music and having a great time. Quite a lot of people said iit was the best party they had been to in a long while and this was mainly due to your brilliant party songs and music. Just wanted to say thank you so much for playing at our Golden Anniversary Party on Saturday. Everyone was so impressed with the music. Playing in the background while we ate was awesome with a really good variety of songs, and then the sing along towards the end was great too with everyone joining in. My voice had gone on Sunday morning with all the singing. You made the party very special. 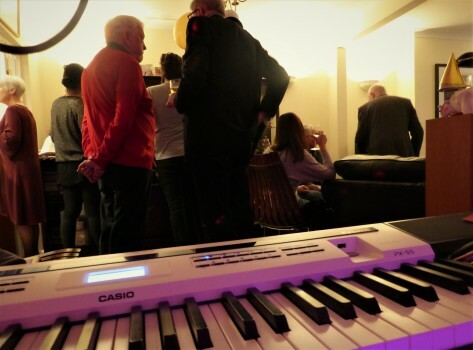 We will certainly recommend you to anyone who is looking to make a party a bit different, live music makes a lovely change from disco or records. We have known Vic Cracknell from the pub circuit for a few years and had no hesitation to book him for my 50th birthday party. Vic provided a unique experience where our guests choose their favourite songs for him to play and sing. We all had a fantastic time, needless to say, the party was an amazing success - Thank you Vic. Just wanted to say thank you for making my Party such fun. I was totally surprised when you turned up - and I think you soon realised that we all like a good singalong!! Everyone really enjoyed it and I'm so glad that Claire booked you - what a great daughter I've got! Just started back to normal after a fortnight’s honeymoon. Many, many thanks for playing at our wedding reception, our guests loved the concept of the Human Jukebox just as much as we do and we have had lots of positive comments. My daughter loved your rendition of “Song, Sung Blue” (which I’m sure isn’t on your playlist) which gave her the excuse for a dance with her Dad! She had originally suggested we had a disco, but, having experienced your songlist, now agrees you were much the better option. We definitely will be seeing you at some of your future gigs, especially the Jukebox ones. A big thanks to you Vic for entertaining us all at Copthorne Golf Club last night. We had a decent size audience, nearly 80 of us, and everybody had a great evening. Several people said you got the balance right with the style of music you played and you engaged well with the audience. I hope we get the opportunity to have you play here again in the future. Once again, thank you for your contribution to the party. We all had a great time and enjoyed choosing, and dancing to, our favourite tunes. Did you notice how you managed to get three generations dancing to the same sound! What a great way to end a terrific weekend at Alton Rugby Club with huge thanks to you Vic Cracknell, for helping our guests raise the roof with songs old and new that were played excellently and set the tone perfectly too. Truly a master craftsman with guitar and keyboard! My husband and I chose Vic Cracknell to play at our Farewell Gathering before we move to Cornwall. He was terrific! His music was exactly right for our party and everybody commented on how good he was. His repertoire was amazing and he played both keyboards and guitar. As well as all this Vic is a lovely man! We just wanted to say a massive thank you to you for making our special day sound amazing and learning our favorite song that we requested! You were so accommodating! I am so pleased we found you, I can’t imagine how the day would have been without your piano, guitar and singing skills. So many of our guests commented on how much they enjoyed listening to you whilst we were eating and socialising, and what a good idea they thought it was to have you there. Friends of ours are getting married in April 2012 and have asked us for your contact details. I have given them your website address. I hope I get to see you again in April. Thanks again for everything. Your music and singing and playing was just perfect and you had a wonderful way of just knowing what was needed at the right time. The background music for dining was just right – loud enough to hear but still be able to talk and stepped up a little which encouraged people to get up and dance and not drift away to the bar! Finally towards the end of the evening you upped the tempo again with a mixture of older and up to date music which no one could resist getting up to dance. A really great evening and we will certainly recommend you to anyone having a function. Really great music. I’ve had emails from everyone saying they had the best Christmas party ever. it really did go very well. Thankyou for such a good evening and I look forward to seeing you when you next play the Chequers. Happy Christmas. Thanks from all of the Beacon Hill rabble and Hindhead RBL Events Committee you were fantastic last night and the crowd loved it! You certainly got everyone going! We were impressed with Vic from the point we went to see him play at the Chequers Pub when we had a very enjoyable evening. We were then pleased that Vic was willing to come and have a look at the venue and meet with us to discuss our requirements. On the night of the wedding, Vic was very patient when the start of the evening was behind schedule. When we did get going the music was very good, both what Vic played live and the ‘DJ Sets’ which he also provided. He even managed to find some very obscure songs requested by our guests, and many have commented how good the entertainment was. Overall we would definitely recommend him and may have to come back to Chequers for another good night out. I just wanted to pop you an email to say a HUGE thank you for playing on Monday at our Summer Festival. I had many people asking me about you and where I found you from as you impressed them with your amazing set. I appreciate you had a gig that evening too and hope that went well. We managed to raise £226.20 for the local charity SEED and were pleased with the turn out! As you know it was our first event we have put on here at The Stag and have agreed we will make this into a annual event……meaning you may receive a call from me next year begging you to play again! I hope you enjoyed yourself on the day and thank you again for your support and time on the day! Fantastic atmosphere last night, with Vic Cracknell doing his human juke box requests…lovely crowd in, full inside and out with loads of familiar faces and a whole bunch of newbies too!! Two birthdays and hope the Bride made it on time today!! I just wanted to say a huge thank you for your fantastic set on Friday! It went down so well with all the guests and Pete and I thoroughly enjoyed it! I didn't expect everyone to be dancing so early, so well done and thank you so much, it made our wedding perfect! Thank you for entertaining our elderly folk at the Alton Maltings last Thursday, there were many compliments received about your performance. I had the sweetest party. The musician we hired, Vic Cracknell was delightful, so kind warm and lifted our spirits. Vic made a big contribution to the atmosphere at our “London Night”. He managed to choose suitable songs to play in the background, he was so friendly and flexible when working with the members of our drama group and his choice of songs for the London singalong was just right. It was a super evening. Apologies for the lateness of this e-mail, we shot straight off to our honeymopon for a couple of weeks and it’s taken a while to get back into the swing of normal life! Just wanted to e-mail and say a big thank you for playing at our wedding on the 19th January. I know it was a little difficult with the snow falling thick and fast, so we appreciate it that you were able to make it. We had a fantastic day and we have some great memories. All the best for the future. Thanks again. Just a quick note to thank-you so much for your contribution to our hugely successful Valentines Supper. Your ability to ‘read’ your audience and to play appropriate music to fit the mood of the event shone through. The ‘sing along’ bits for those who weren’t dancing made everyone feel that they had joined in! I saw lots of our guests again this morning and without exception they had a great party last night and they all spoke in glowing terms of your talents! Thanks for a fabulous session at the Hindhead Royal British Legion on Friday! Really, really enjoyed it and loved the sing-a-long. Thank you for entertaining us as at our wedding party last Saturday, you were a big hit with all the guests, they particularly enjoyed your son’s cajon it added a lot to the performance and was very nice of you to let one of the guests have a go. Your planning of the play list was perfectly judged for our guests and I’d recommend you to anyone who needs live music for an event. Hi Vic, thank you so much for Saturday, it really has gone down as one of our best parties!!! All the girls now want to book you every year for a do! So I am sure we will be seeing you again! Great night as ever Vic thank you….and wonderful to see a full house all on their feet!! Thanks to Vic Cracknell for putting on an outstanding performance at the Phoenix Centre Cockney Night. The blokes a living legend!!!! From all of us. We thank you so much. My voice has gone with all the singing. What a way to spend a Saturday night! We’ve been away in Swanage since our great evening on 10th May and I now realise that I didn’t contact you after the event to ensure that you had a safe journey home, Thank you yet again for making the evening so enjoyable and to tell you that folk are already asking when you can come again! I’ll keep in touch and will certainly let you know when we plan another similar event. Thank you so much for Sundays party. Everyone was very pleased indeed with your range of instruments and song choices you had, your enthusiasm which saw quite a few ‘oldies’ up dancing and your all round likeability! A great time was had by all and in no small part to your contribution. Would definitely recommend you and book you again. Vic, many thanks for playing at our birthday celebrations last Saturday.We were all entertained by your choice of music, playing and singing. I heard from many of our guests how much they enjoyed the music, and were especially pleased that it was played live. Several people asked us where we ‘found’ you, so we pointed them to your website. I guess my greatest compliment, is that you fulfilled your brief exactly as I had hoped you would. Well Done. Well the house is back to normal, but what a party we had!! Thank you so much for being a big part of it, so many people have said how much they enjoyed the live music! I got to bed at 3am, the last slightly inebriated guests left at 2.30! Thank you very much for all your hard work at my wedding. The music was just right and everybody said how much they enjoyed what you did and asked for your details. You provided the right amount of background music and dance music. Well done and thanks again. I visited the UK for the first time ever last July and attended your sing along gig at Guilfest with some friends. We dropped by after Kool and the Gang wrapped up their energetic show on the main stage. Just wanted to let you know that we had a great time throwing out requests and singing along with you. What a fun night! Wish you were playing in my neighborhood in Port Credit, Ontario Canada. Wishing you all the best. Thanks once again Vic for playing at Sandra’s party last night. Sandra really enjoyed it, and many people commented positively on your playing and choice of material. Just a quick line to say thanks so much for helping my wife's 50th birthday party go with a bang. Your choice of music was great, and the sing-a-long at the end really made it. Thanks... a fun evening was had by all! Your entertaining tunes worked really well and certainly hiked up the party brilliantly – thanks again.